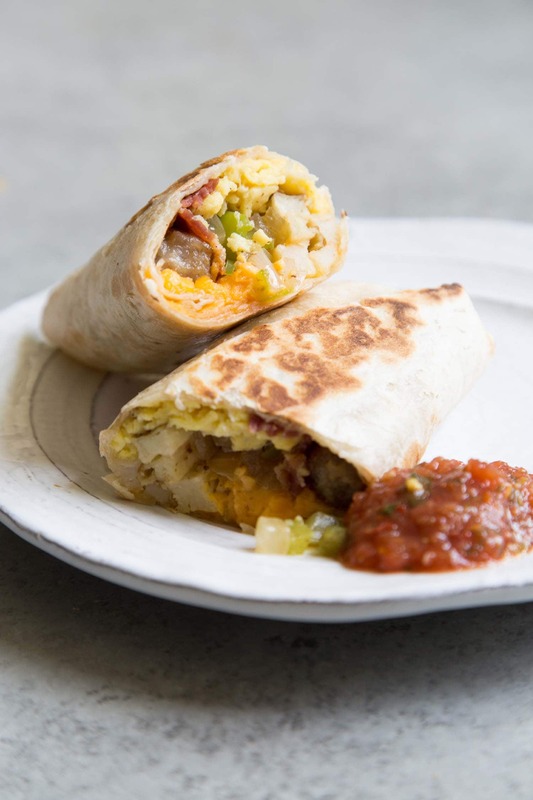 These make-ahead frozen breakfast burritos are filled with sausage, bacon, eggs, potatoes, veggies, and cheddar cheese. I take breakfast seriously. I may forget to eat lunch every now and then, but I NEVER ever skip out on breakfast. When I’m craving a breakfast burrito I head to my freezer. I keep a stockpile of various homemade burritos for whenever hungry strikes. 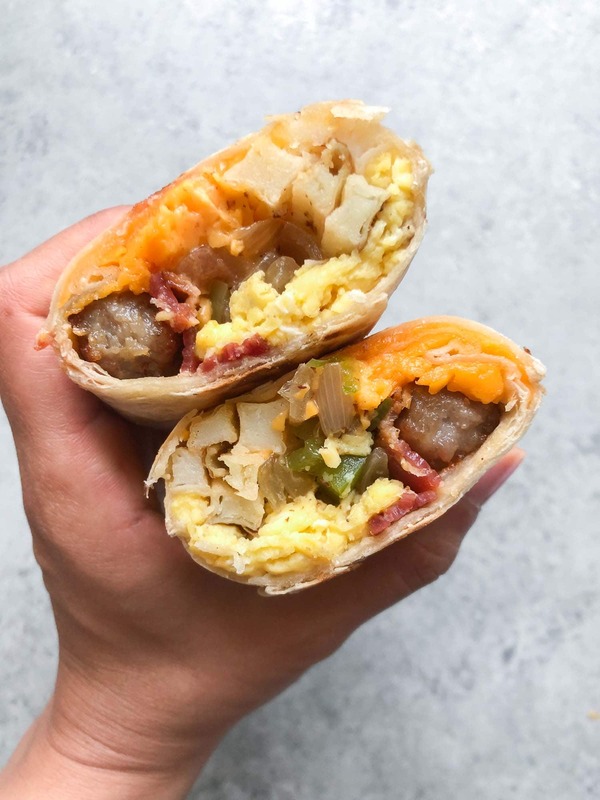 These frozen breakfast burritos are filled with all the morning standards: pork sausage, crisp bacon, scrambled eggs, potatoes, veggies (onion and bell pepper), and cheddar cheese. Directly from the freezer, the frozen burrito is gently reheated in the microwave, and then finished on a hot skillet for color and crunch. From start to finish, it takes about 8 minutes. Not bad for a quick homemade meal! We eat a ton of bacon at my house. There is always a supply of bacon in the freezer. Bacon and rendered bacon fat add favor to a ton of dishes. The most important step when it comes to rendering bacon fat: start with a room temperature skillet! Place raw bacon in an even layer over a room temperature skillet. Set over low-medium heat to slowly warm up the pan and warm up the bacon. In a few minutes the bacon will start to release it’s fat and the raw bacon will cook in it’s rendered fat. Flip the bacon often so it evenly cooks. Cook bacon to your desired doneness. Transfer cooked bacon to a paper towel lined towel. Pour rendered bacon fat into a heat safe container and store in the fridge for later use. What to do with rendered bacon fat? Cook with it! The rendered bacon fat can be used to cook vegetables, instead of oil or butter. It adds a smoky richness to veggies. It can also be used for breads, pancakes, cakes, muffins, or pasta. Fries, Tater Tots, or Potato Hash? The choice is yours! These frozen breakfast burritos can be filled with your choice of cooked potatoes (or sweet potatoes)! I suggest fries or tater tots. They’re much easier for assembly sake. Cook your potatoes from scratch or simply heat up some frozen ones. Store-bought frozen fries or tater tots are perfect for this! Start by warming up the tortillas in the microwave for about 15 seconds, or in a skillet over medium heat until the tortillas are flexible. 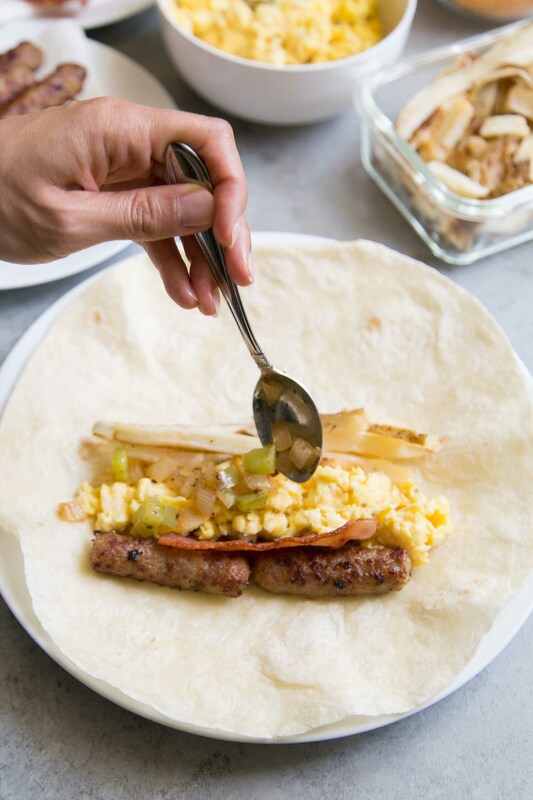 Build the burrito by placing sausage links and bacon toward the bottom third of the tortilla. Add eggs, veggie, a small handful of potatoes, and a generous sprinkling of cheddar. Fold in the two sides (left and right) of the tortilla. Starting with the edge closest to use, roll the burrito up tightly. Place assembled burrito seam side down on a baking sheet or plate, and repeat with remaining tortillas. If the tortillas start to lose their flexibility, simply reheat again. The burritos can be enjoyed immediately, or individually frozen for later consumption. To freeze, individually wrap each burrito tightly in foil. Arrange in a single layer on a freezer safe plate. Freeze until solid, about 2 hours. Transfer frozen burritos to a freezer bag. This will keep in the freezer for up to two months. When you’re ready to eat, remove foil wrapper. Loosely wrap frozen burrito in a moist paper towel. Place on a microwave safe plate and microwave at half power for 90 seconds to 2 minutes on each side, until warmed throughout. If desired, toast burrito on a skillet over medium heat. And enjoy! 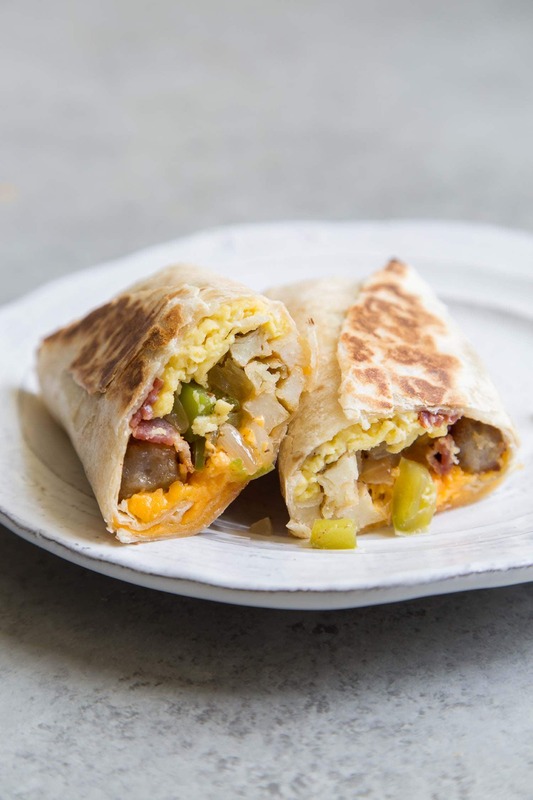 These make-ahead frozen breakfast burritos are filled with sausage, bacon, eggs, fries, veggies, and cheddar cheese. Sausage: Pan fry according to package instructions. Set aside. 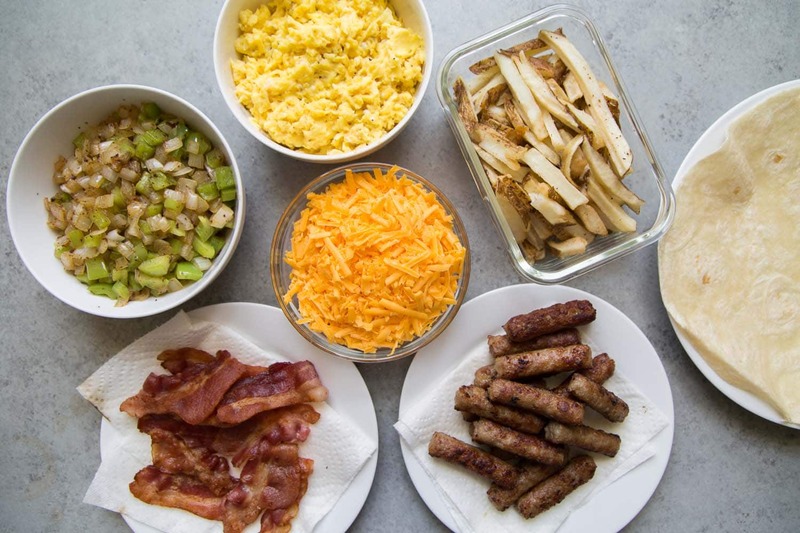 Bacon: Place bacon in a single layer in a large skillet (cold skillet). Set over low heat to slowly render bacon fat, about 2 minutes. Increase to medium heat. Turn bacon strips often to ensure even browning. Cook bacon to your desired crispness. Place bacon on paper towel lined plate to drain. Pour rendered bacon fat into a small bowl and reserve for later use. Veggies: Add 1 tablespoon of rendered bacon fat into skillet used to cook bacon. Warm over medium heat. Add chopped onions. Cook until almost translucent. Season with a pinch of kosher salt. Toss to combine. The moisture from the onions should help release any bacon drippings on the skillet. Add chopped green bell peppers. Toss to combine. Cook until softened. Remove from heat and transfer veggies to clean bowl. Eggs: Whisk together eggs, milk, salt, and pepper in a large bowl until thoroughly combined. Heat one tablespoon butter (or neutral oil like grapeseed oil) in a large nonstick skillet over medium heat until warm. Pour in egg mixture and reduce heat to low. Add eggs begin to set, use a spatula to gently push and pull the eggs across the skillet to form soft curds. Continue this process over low heat until there are no longer any liquids. Remove from heat and transfer scrambled eggs to clean bowl. Assembly: Warm tortillas in the microwave (about 15 seconds) or in a skillet until flexible. Build the burrito by placing two sausage links and one bacon slice towards the bottom third of tortilla. Add 1/8 of scrambled eggs, 1/8 of veggie mix, a small handful of fries, and a generous sprinkling of cheddar. Fold in the two sides of tortilla. Roll burrito up tightly. Place seam side down on a baking sheet or plate. Repeat with remaining tortillas. To enjoy immediately: Place burrito seam side down on a skillet set over medium heat for about 2-3 minutes until toasted and seams are sealed shut. Flip burrito to warm and toast other side. To freeze: Individually wrap burritos in foil. 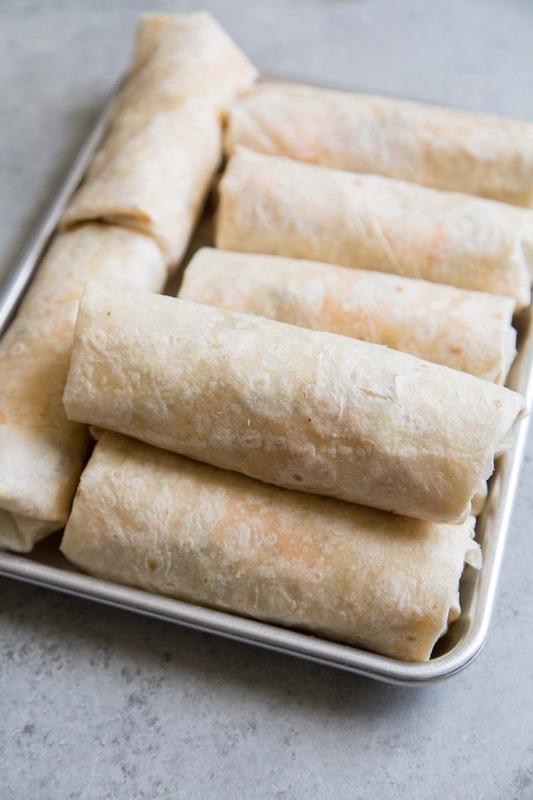 Arrange tightly wrapped burritos in a single layer in a freezer safe plate or baking sheet. Freeze until solid. Transfer burritos to a freezer bag. To reheat: Remove foil wrapper. Wrap burrito in a moist paper towel and place on a microwave safe plate. Microwave at half power for 90 seconds to 2 minutes on each side, until warmed throughout. If desired, place thawed burrito on skillet to toast. I used two 8 oz packages of Farmer John Classic Pork Links. These sausage links are skinless, meaning they do not have casing. Frozen burritos should keep in the freezer for up to 2 months. It is important to wrap frozen burrito in moist paper towel. This will prevent the tortilla from drying out.